A lot of bikes have a rather short fender at the front. 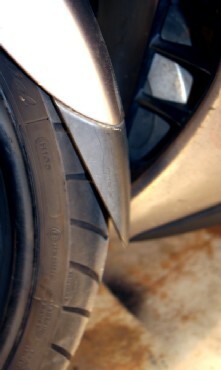 There are fender extenders on the market wich have to be screwed to the existing fender. This looks ugly in my opinion so I looked for an alternative. The answer is glueing! I found a universal construction cement (or kit as we say in Dutch) from the make Bison. It's available at hobbystores in a lot of European Countries. It kits a lot of material together, from iron to wood to concrete, and is highly suitable to mount various parts on your bike. After cleaning both surfaces thoroughly with alcohol, put a few dots of kit at your extender and press the extender firmly at its right place under the fender. Keep the pressure for a few minutes and let the kit dry for 24 hours. 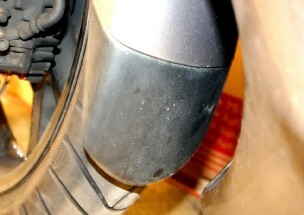 This joint is extremely strong and will easyly hold the extender in place without damaging your fender!